Few of life’s milestones are as memorable as having a child, so it’s no wonder you want your shower to live up to the momentous moment. It’s important to make sure you keep the focus on mommy (and daddy) and the new addition, but baby shower décor can still wow your guests with a brunch-themed party. FLEXX and Jolly Events Team Up for Your Event! Are you ready to put on an event but you don’t know where to begin? Don’t worry - the teams from Jolly Events and FLEXX Productions are partnering up to help you! It must be baby season right now, as I just received an invite for the second baby shower to attend this month, and I am currently planning a baby shower for a friend later this summer! 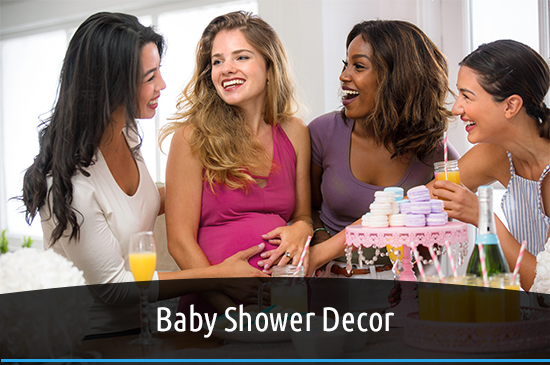 Adding a few rental items will make any baby shower look great, and is pretty inexpensive to do so! Instead of going out and buying new things such as a large vase, cupcake tree, large glass carafes, why not rent them?! Renting some special linens to match your color scheme makes any table-scape gorgeous!